The Denver Gold had a 3-1 record heading into Memphis to face the Showboats in a United States Football League game on March 25, 1984. Coached by Craig Morton, the Gold had a strong fan base that was being rewarded with improved offensive play. QB Craig Penrose, a former teammate of Morton’s with the NFL Broncos, was behind center and had promising rookie WR Leonard Harris, who also returned kicks, as a target while productive RB Harry Sydney was the best of the backs. The first-year Showboats, coached by the colorful Pepper Rodgers, were struggling at 1-3. Rookie QB Walter Lewis was more noted for his running than passing, but the defense was anchored by DE Reggie White, a first-year player out of Tennessee who was showing off the abilities that would make him an all-time great. There was a crowd of 21,213 in attendance at the Liberty Bowl. The Gold jumped out to a 14-0 lead thanks to two Memphis turnovers. The first was a fumble, which led to a nine-yard touchdown carry by RB Vincent White, and then a pass interception that set up a Craig Penrose TD pass to TE Bob Niziolek that covered 36 yards. 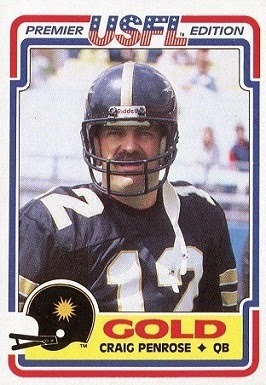 Brian Speelman added the extra point after each. Early in the second quarter, Alan Duncan kicked a 48-yard field goal to finally get the Showboats on the board and the score remained 14-3 at the half. Memphis narrowed the margin in the third quarter, this time benefiting from a Denver turnover as SS Terry Love intercepted a Penrose pass and returned it 79 yards for a TD. Just before the end of the period, the Showboats took the lead when Walter Lewis scored on a one-yard touchdown carry. Duncan successfully converted after each score and the tally was 17-14. Denver responded on the next series by scoring on a Penrose pass to WR John Arnold that covered 34 yards. The Showboats put together a 16-play, 72-yard drive that culminated in RB Alan Reid running for a one-yard touchdown and, with the successful extra point, they led by 24-21 with under three minutes to go in the contest. There was still enough time for the Gold, and they went 66 yards on their next series. Penrose threw to Leonard Harris for a 27-yard gain to the Memphis 25 and, with 57 seconds remaining, Vincent White scored from 16 yards out. Speelman added the PAT and Denver came away with a hard-earned 28-24 win. Memphis led in total yards (323 to 277) and first downs (19 to 11). The Showboats were hurt by the two early turnovers that put them in a hole, while Denver turned the ball over once. There were many penalties, with the Gold being flagged 9 times at a cost of 50 yards to 8 penalties for 63 yards on Memphis. Craig Penrose completed 12 of 20 passes for 177 yards and two touchdowns while giving up one interception. Harry Sydney ran for 54 yards on 12 carries and Vincent White was right behind with 52 yards on 7 attempts that included two TDs. Bob Niziolek had three catches for 45 yards and a touchdown and John Arnold gained 49 yards on his two receptions that also included a score. For the Showboats, Walter Lewis was successful on 17 of 25 throws for 175 yards and a TD as well as one that was picked off. He also ran the ball five times for 37 yards and a score. Alan Reid had 22 carries for 71 yards and a touchdown and added another 34 yards on four catches. WR Derrick Crawford led the club with 5 pass receptions, for 31 yards, while WR Cormac Carney gained 52 yards on his three catches. On defense, Reggie White accounted for both of his team’s sacks. Denver’s promising start failed to hold up over the long haul. 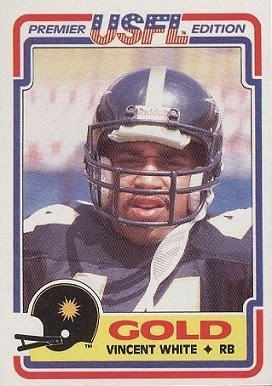 The Gold won their next three games to reach 7-1 before the bottom fell out and they lost eight of their last ten contests to finish at a disappointing 9-9 and third in the USFL's Pacific Division. Memphis won the next week but continued to struggle and ended up fourth in the Southern Division at 7-11. Craig Penrose ended up being one of five quarterbacks utilized by the Gold, but was the most productive as he completed 60.3 percent of his passes for 1984 yards and 12 touchdowns along with 14 interceptions.